The Napoleon Allure 32-inch Electric Fireplace can heat a room up to 400 sq. ft. and is as simple to install as hanging a piece of art on your wall. No specialists or gas fitters needed. Three flame options allow you to have traditional orange flames, cool blue flames, or a beautiful combination of the two that sparkle with the glittering glass ember bed. The ultra slim 5-inch depth means you have plenty of space, the fireplace doesn't intrude into your room. The included remote gives you complete control at the touch of a button. The Allure 32 Electric Fireplace is functional art for every space. At home in traditionally styled studies and living spaces, the Madison Electric Fireplace Mantel puts keepsakes on display in classic style. Constructed of solid Pine, the sturdy mantel provides 58 inch of mantel space to design throughout the year. Taking center stage is the impressive brick-look surround that accentuates the 28 inch Dimplex Electric Fireplace and complements the natural Stone Grey finish. Finished off with time-honored crown molding and pilaster details, the Madison Electric Fireplace represents an era of stunning craftsmanship beautifully. Featuring an industrial, distressed design, the Ramona Electric Fireplace Television Stand is a one-of-a-kind mixed media model. Featuring a single, adjustable shelf in the twin open cabinets and features a 23 inch Dimplex Electric Fireplace for instant ambience and warmth. Supporting a flat screen television up to 50 inch, Ramona's washed Autumn Bronze finish and contrasting black steel, cross frame is a dream of mixed media modern design. 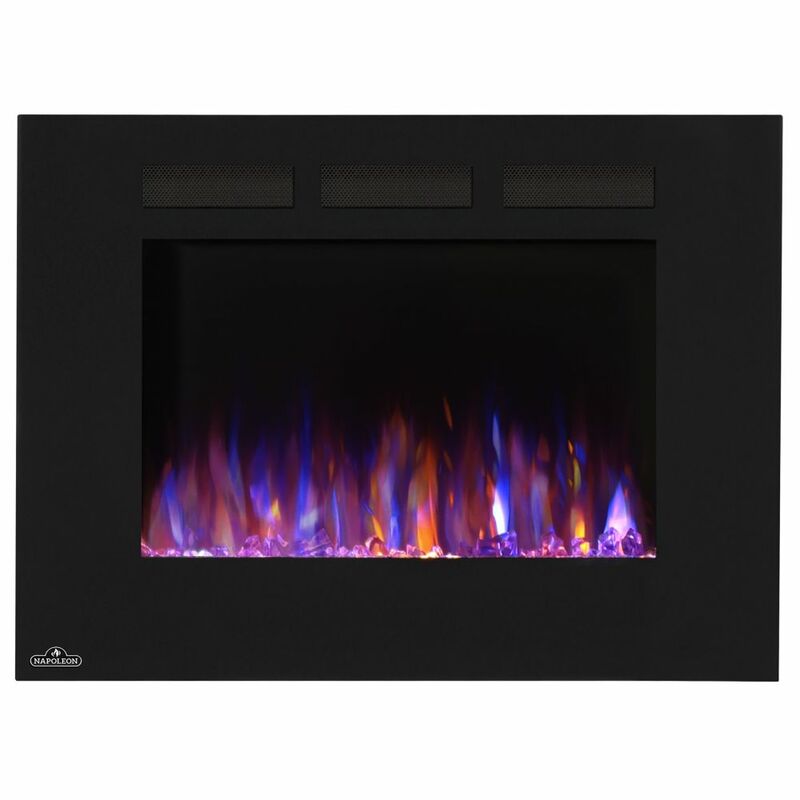 Allure 32-inch Linear Wall Mount Electric Fireplace The Napoleon Allure 32-inch Electric Fireplace can heat a room up to 400 sq. ft. and is as simple to install as hanging a piece of art on your wall. No specialists or gas fitters needed. Three flame options allow you to have traditional orange flames, cool blue flames, or a beautiful combination of the two that sparkle with the glittering glass ember bed. The ultra slim 5-inch depth means you have plenty of space, the fireplace doesn't intrude into your room. The included remote gives you complete control at the touch of a button. The Allure 32 Electric Fireplace is functional art for every space. Allure 32-inch Linear Wall Mount Electric Fireplace is rated 4.7 out of 5 by 6. Rated 3 out of 5 by Gena from Not impressed for the price. ... Not impressed for the price. Rated 5 out of 5 by PSWANS from This is my second time purchasing this item as i loved it so much i had to put another one in. Mo... This is my second time purchasing this item as i loved it so much i had to put another one in. Most realistic flames, warms a room nicely, but it looks so wonderful, i couldnt be happier with this product. Number #1 brand, costs a bit more but when you install it and see how beautiful it is, you will be happy you bought this one. No comparison! Rated 5 out of 5 by Paddi from Very well packed and came in perfect condition. The unit... Very well packed and came in perfect condition. The unit is very nice looking and well made. The installation was easy with good instructions. Rated 5 out of 5 by Happy from Absolutely stunning! We installed it in the family room built-ins. It has multiple color settings... Absolutely stunning! We installed it in the family room built-ins. It has multiple color settings, two colors and heat\no heat settings. It was fairly easy and straight forward to install. This model is 5&quot; deep. The heat comes from the top front of the unit.